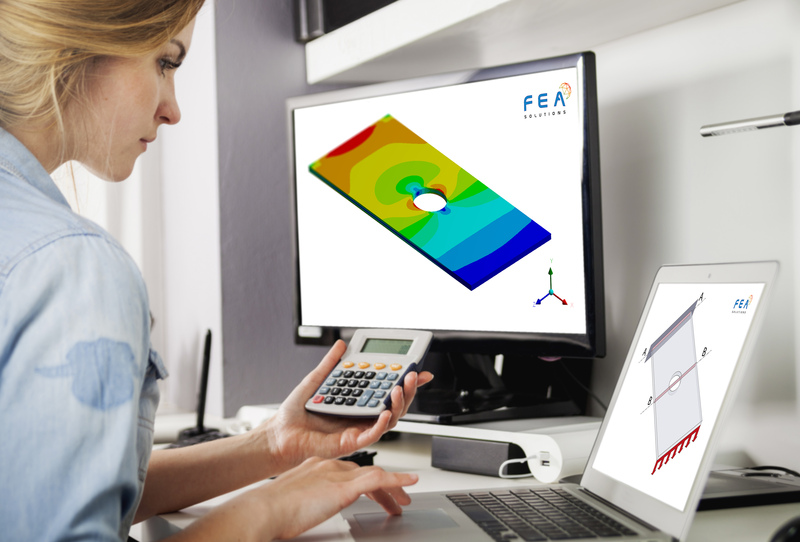 FEA-Solutions (UK) Ltd provides numerical simulation (FEA, CFD) as well as analytical engineering calculations, sometimes called hand calculations or handcalcs. The difference between the two methods will be explained using a static stress analysis example. A horizontal plate with a hole is fixed to a wall and subjected to a vertical uniformly distributed load at its free end, as shown on the laptop screen. For a handcalc, it would be good practice to work out the stresses at section A-A where the highest bending moment is, and at section B-B where the weakest cross section is. In both cases, it would be assumed that the stress is uniform along the width of the plate (there are however more complex handcalc approaches available which could take possible non-uniformity into account). The FEA shows that the stress is actually not uniform along the width of the plate. Consequently, for this example the peak stress results from FEA are considerably higher than those from handcalcs. Hence, the handcalc results are unsafe. Handcalcs require simplifications which often cause the results to be less accurate. For complex structures, appropriate handcalc methods are not available. For handcalcs, stresses will be calculated only at certain sections which the analyst has to select. This might however result in the highest stressed location being missed. FEA on the other hand takes the whole structure into account, hence the highest stressed locations will always be considered. In addition to stress results, FEA provides many other results (e.g. deformation, reaction forces etc.) with no additional effort. In a handcalc, each of those has to be calculated separately. FEA allows to show results graphically, including deformed shapes and animations, with no additional effort. FEA reports are easy to understand, even for non-technical readers. FEA is often less work and hence more cost effective than handcalcs. Call us today on 01202 318128 and let us find the best analysis method for your real world engineering problem.